Any one who has tried, as I have often done, the process of getting out of bed at 2 a.m. in a winter night, lighting a candle, and recording some happy thought which would probably be otherwise forgotten, will agree with me it entails much discomfort. All I have now to do, if I wake and think of something I wish to record, is to draw from under the pillow a small memorandum book containing my Nyctograph, write a few lines, or even a few pages, without even putting the hands outside the bed-clothes, replace the book, and go to sleep again. … I tried rows of square holes, each to hold one letter (quarter of an inch square I found a very convenient size), and this proved a much better plan than the former; but the letters were still apt to be illegible. Then I said to myself ‘Why not invent a square alphabet, using only dots at the corners, and lines along the sides?’ I soon found that, to make the writing easy to read, it was necessary to know where each square began. This I secured by the rule that every square-letter should contain a large black dot in the N.W. corner. … [I] succeeded in getting 23 of [the square-letters] to have a distinct resemblance to the letters they were to represent. Think of the number of lonely hours a blind man often spends doing nothing, when he would gladly record his thoughts, and you will realise what a blessing you can confer on him by giving him a small ‘indelible’ memorandum-book, with a piece of paste-board containing rows of square holes, and teaching him the square-alphabet. Obviously, we don't have his problem(s), if only because we have electricity that can be switched on/off easily to operate a light, a tape recorder, a PDA, or whatever. 1. Wikipedia, also has a picture of the device. From the Website by John D. Norton"Einstein's search for general relativity spanned eight years, 1907-1915. Some periods were quiet and some were more intense. The moments when the great transition occurred, came sometime between the late summer of 1912, when Einstein moved from Prague to Zurich, and early 1913. If we could choose one time at which to look over Einstein's shoulder and watch him work on general relativity, it would be this time. And that is just what we can do. For, found among his papers when Einstein died in 1955 was a small, brown notebook containing his private calculations from just this time. This is the Zurich notebook." "The notebook has two front covers. Einstein wrote in it in both directions. There is the front cover shown above and first here. It has Helen Dukas, Einstein's secretary's, typed description of the notebook as "Notes for Lectures on Relativity..." If we flip the notebook over, we find a second cover with the word "Relativity" in Einstein's hand." 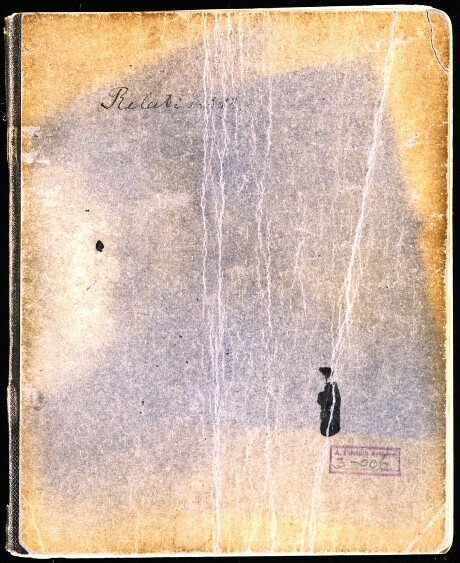 The picture shows the second cover. Many people filled their notebooks this way, starting one set of notes from the front, and a second one from the back. See here. '"Evernote’s core text editing experience was designed around a framework that was optimized for the platform you were typing on; the Windows editor was purpose-built for Windows, the Mac editor for the Mac platform, and so on. We had an early vision of mobile’s implications on productivity, and highly platform-specific development was the fastest way to address that mobile future, which arrived quicker than we’d even imagined. In the face of rapidly interconnected devices, this framework generally held together well, but it wasn’t completely seamless", the company explains.' Now it is supposed to be completely "seamless." In my experience the "editing experience" was never that important, as I never used it for writing. "Scriptogram will discontinue operation on September 14th, 2015." Longer version: "We have decided that it’s time for us to face the reality. Due to the lack of time designing and building Scriptogram, we’re looking for someone who’d be interested in taking over the entire ship from us. Code, name, domain, trademark. You name it. The Scriptogram platform will discontinue operation on September 14th, 2015, so please contact us before then." This means that the pages I published there (to supplement the information given here) will no longer be available. Sorry!